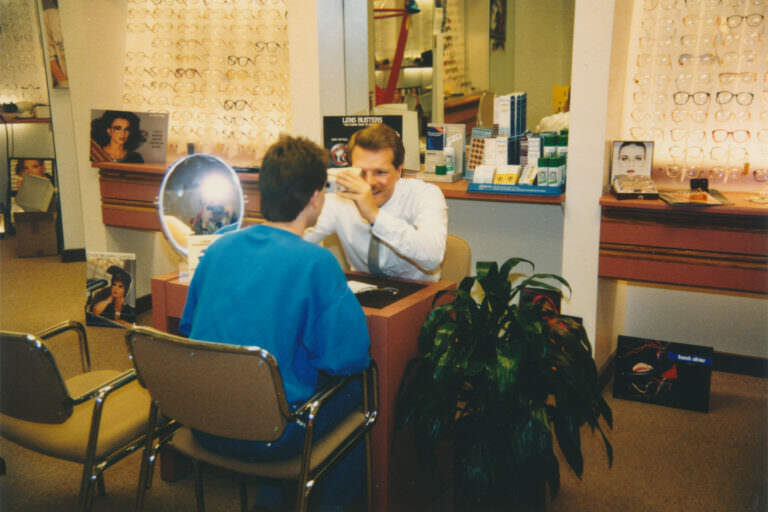 Family-owned, devoted, and independent, Klein Optical has been serving for 25 years. Robert Klein began the business in partnership with his two sons Daniel and Peter in January of 1991. A Licensed Optician of the College of Opticians of Ontario since 1987, Daniel is dedicated to vision excellence and customer satisfaction. Dan ensures clients achieve the best possible sight at their budget through quality products and precise fitting. In 2004, he embarked on a mission trip to Mexico City, fitting 23,000 patients with recycled eyeglasses. A firm believer in the improvements brought with the advancement of technology, Dan is educated on the latest lenses, coatings and measurement equipment with the purpose of achieving each patient’s full vision potential. As you enter the store, Shelly and Andrée greet you with smiles. Both specialize in customer service and frame selection, dedicated to finding the very best frame to match your style, face, and lifestyle. Shelly has a background in interior design while Andrée has worked in the optical dispensary industry for over 25 years. Rest assured you will get a style opinion you can trust. You’re sure to hear from one of them again when a friendly call arrives to let you know that your glasses are ready. A trained lab technician, Elliott cuts prescription lenses carefully and precisely to your chosen frame and performs frame repairs such as screw and nosepad replacements. Also our IT Administrator, Elliott manages our website and social media. Do not hesitate to reach out to Klein Optical on Twitter or Facebook with any questions and he’ll do his best to help. We are not satisfied until you are. All frames and lenses are backed by our 90 day Look & Lens Guarantee. If you decide you don’t love your frame, you have trouble adjusting to your new lenses, or your prescription changes within 90 days of your purchase, we’ll make sure you get a frame with lenses you love. All current model frames and lenses are also backed by a full Two Year Warranty, covering manufacturer’s defects as well as unusual wear and tear. We believe that the bitterness of poor quality remains long after the sweetness of low price is forgotten. As such, we invite you to come back at any time for complimentary adjustments and maintenance, a part of our service to you.